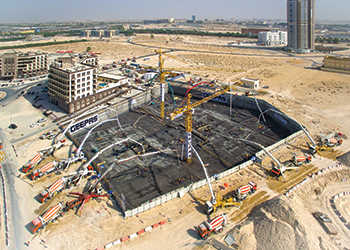 Close to 20,000 cu m of concrete was poured continuously over a period of 42 hours. 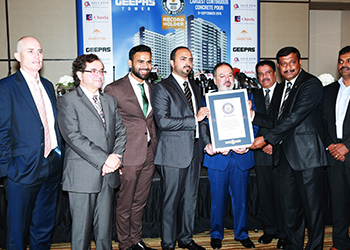 Geepas Tower has entered the Guinness World Records for completing the largest continuous concrete pour in the world. The Dh600-million ($163 million) mid-rise residential tower, which is rising up at Al Barsha in Dubai, UAE, is owned by Western International Group. It is being built by Gulf Asia Contracting (GAC), the construction arm of the RP Group, a multi-billion-dollar business conglomerate. Chawla Architectural and Consulting Engineers is the project’s consultant. 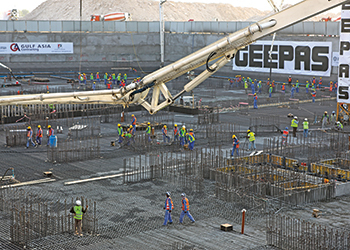 The milestone, in which 19,793 cu m of concrete was poured continuously over 42 hours, was accomplished in September with the help of over 600 skilled workers undertaking the job in multiple shifts. The concrete for the project was delivered by Unibeton Ready Mix, which engaged more than 300 transit mixers making more than 2,500 trips from more than three plants to deliver the concrete required for the pour. The concrete pour was carried out by massive installations of 14 concrete pumps on site with an additional five pumps on stand-by. More than 3,000 tonnes of steel were used and 150,000 manhours have been put into constructing the raft of the building. Officials pose with the Guinness certificate. The mammoth concreting task was efficiently co-ordinated by the Western International Group and GAC along with Ajit Xavier, senior projects manager of Geepas, Suprabhas Balabhadran, the director of projects at Chawla Architectural and Consulting Engineers and Unibeton Ready Mix. “We are confident of delivering a truly high-quality residential development that will add to the quality of life of our residents in the country. I would like to congratulate the entire team that has toiled day and night for this project to make it possible,” he states. Sreekanth Ramachandran, the manager (projects) at GAC, says: “With a built-up area of 1.5 million sq ft, the tower is another of the major undertakings by the company in the UAE. Ayman Salah Bustami, the senior vice president of Unibeton Ready Mix, says: “Since the early 1990s, Unibeton has been at the forefront of readymix concrete innovation in the Gulf. We are honoured to have participated in such a monumental achievement. With a built-up area of 1.5 million sq ft, Geepas Tower has 684 residential units, a fully-equipped gymnasium, health club, swimming pool and 730 space car park. With two levels of basement parking, a ground floor with a welcome lobby, 40,000 sq ft of retail space, and 19 floors of residences, the tower has been designed to the highest standards of aesthetics and is scheduled for completion in March 2018.